Fromage D'Affinois is a bloomy rind double cream, cow's milk cheese made by Guilloteau creamery. 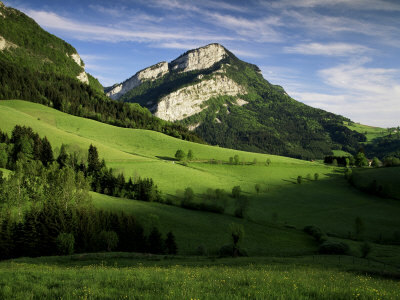 Located in the heart of the Pilat Regional Park in the Rhône-Alpes region of France, Fromager d'Affinois is produced by Fromagerie Guilloteau. 20 years ago, Guilloteau pioneered the use of ultrafiltration, which removes water from the pasteurized milk before cheesemaking, concentrating all the other components. This means every step of the cheesemaking process: coagulation, unmolding, maturing, can happen faster. A classic Brie takes about eight weeks to make; Fromager d'Affinois is ready in two. In traditional cheesemaking, the curds must be drained to rid them of excess whey. Some proteins, milk sugar and calcium drain off in that whey, which is often discarded or fed to farm animals. With ultrafiltration, there is no draining step because much of the water has already been removed. More protein and calcium remain in the cheese, yielding a product with higher nutrient content and a more luscious texture. 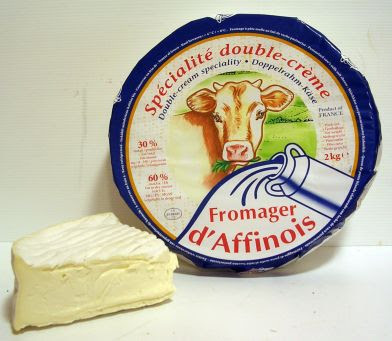 With a fat content of 60 percent Fromager d'Affinois qualifies as a double-cream, halfway between classic Brie (about 45 percent fat) and a buttery triple-cream like Brillat-Savarin (about 75 percent fat). It resembles Brie, with a bloomy white rind and ivory interior, but has a paste that is smoother, softer, and more sensual. Adding an unctuous, and inviting texture with the tempting taste of lightly salted sweet cream, equals a rich buttery brie who will surely seduce you. Pair with champagne or sparkling wine to cut the richness and cleanse the palate.